My father, Group Captain EL McMillan, CBE, AFC, RAF was born a Canadian; his Father died in WWI and the family came to England where he and his sister were sponsored to attend Christ’s Hospital School. My father wanted to be a surgeon, but his family was poor and he had to leave school at fifteen to support his mother. He was called up to join the RAF as a night fighter pilot with 409 Squadron flying Beaufighters VI X813. My Grandmother, after the experience of WW1 pilots, was heard to say ‘Hah, he won’t last long’ but he was able to prove her wrong! Fast forwarding to 2000, my father received a letter from Bill Norman a Canadian historian researching the career of German air ace Willi Schludecker. He had worked out that my father was the pilot of the Beaufighter which shot down Willi’s Dornier DO217 E-4 on 23/24 July 1942. Looking through his log book my Father verified his action. Willi’s aircraft was badly damaged and limped back to Holland where it crash landed, Willi suffering severe injuries; it took him 6 months to recover in hospital. Over the years he wanted to thank my father for basically ‘saving his life’, as after he recovered he became a flying instructor. If he had flown any more operational missions with the Luftwaffe, especially on the Eastern Front, things could well have ended differently for him. Bill Norman pieced together the logbooks of both Willi and my father. The problem he had was that my father had been born in Canada and had thought to have been flying with a Canadian squadron. However, he was able to verify their combat that night and subsequently was pivotal in getting Willi and my father to meet. 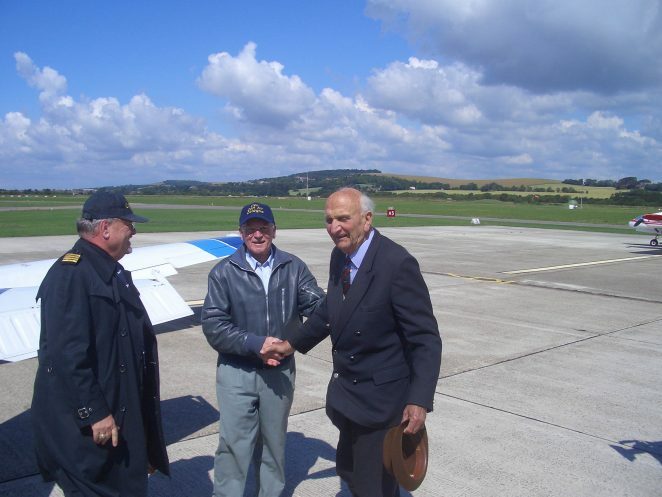 Shown here is a photo of Willi Schludecker on 9th March 2000 meeting my father for the first time at Shoreham Airfield. An emotional reunion, with both men being grateful to have survived. They understood that each others role was to support their own Country during war; now all animosity was long gone. Having visited England for the first time after the war, Willi worked out through his maps where he had dropped and jettisoned his bombs and went to apologise to each area for his wartime actions. 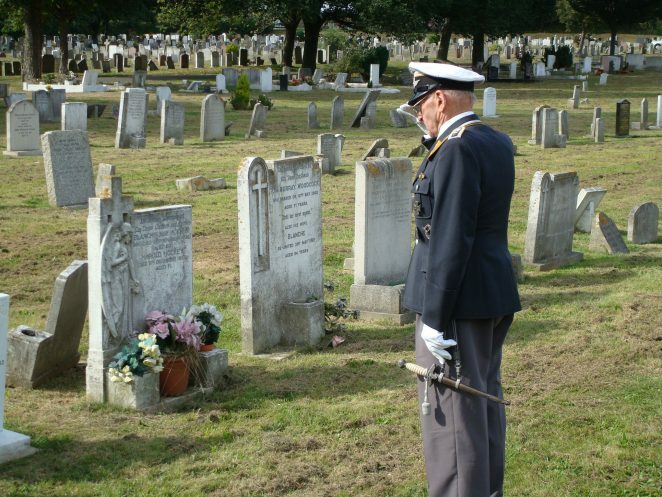 When my Father died Willi paid his respects – dressed in full Luftwaffe uniform – saluting his grave on 31 August 2017. That’s a lovely piece Netta.